As a person living very far from home at the moment I am so thankful for the internet, and especially networks that post episodes of my favorite shows. It was love at first viewing of the Comedy Central show @Midnight, which is hosted by Chris Hardwick of the Nerdist podcast series. He is fabulously nerdy and a big fan of cosplayers, so it came as no surprise when he dressed up in clever costumes for several episodes of the improv comedy show leading up to Halloween. In addition to Luke Skywalker Texas Ranger, he also got decked out by Clockwork Couture in a Steampunk Doctor Who ensemble. From a distance, you wouldn’t know he was posing at the Doctor, but as he told the audience, his splendid cravat actually had his name embroidered in Gallfrayan on it. 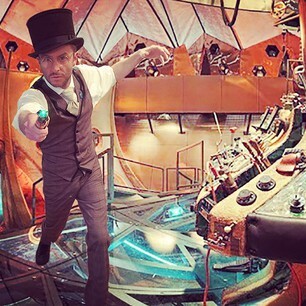 Someone photoshopped Hardwick onto a TARDIS interior and I couldn’t resist posting it. This entry was posted on November 9, 2014 by Phoebe Darqueling. It was filed under Entertainment, Movies and Television, Steampunk You Can Wear and was tagged with @Midnight, clockwork couture, cosplay, Costume, Doctor Who, halloween, steam punk, Steampunk, The Doctor. I love this show too and was so excited to see him in this costume. Between his Talking Dead gig and this show…*sigh* so crushing on Chris. Hooray! I’m not the only one with a list like that.